Cape Cod attracts visitors from around the world who want to explore its scenic coasts and experience its distinct architecture, maritime traditions and delicious cuisine. Located on the very tip of the Cape, Provincetown is an eclectic blend of one-of-a-kind shops, art galleries, wonderful eateries and amazing ocean views. Colloquially known as P-Town, the summer resort is famous for its vibrant nightlife. Commercial Street, the city’s principal waterfront thoroughfare, has a carnival atmosphere throughout the summer. Along with the beautiful seascape, monuments, wharves and lighthouses, you will discover some of the best beaches in the area, including Race Point and Herring Cove. Visitors can avoid the infamous Cape traffic when traveling from Boston by sailing aboard the Salacia, a high-speed catamaran. It is the fastest and largest ship of its kind in the United States. The vessel can travel up to 40 knots and complete the voyage in approximately 90 minutes. A high-tech ride stabilization system makes the ride more comfortable by minimizing the effect of waves and the wind. During the trip, passengers have access to complimentary Wi-Fi, satellite television and cushioned seating as well as a galley that serves a variety of drinks and menu items. A concierge is located on the vessel’s second deck to help passengers arrange their activities while visiting Provincetown. You can view the large map of the area and obtain an assortment of brochures. 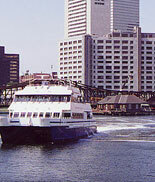 The BHC Provincetown Ferry from Boston service operates from May to October. The vessel sails between the Long Wharf in Boston and MacMillan Wharf in Provincetown.